Business technology has become one of the most important components for successful companies big and small. In an overwhelmingly digital landscape, businesses depend on IT for marketing, data storage, and financial transactions. And with that comes the need to secure every bit of private information cyber criminals might want to feast their eyes on. And while an outsourced security professional is a must, there are a few simple steps you can do yourself to get started. Check out five of our favorites here. 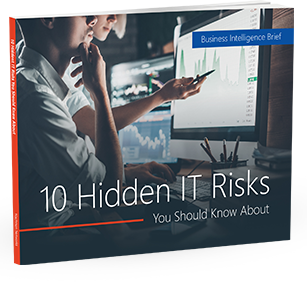 Employees not being educated on data sharing and security is one of the biggest reasons for internal data breaches. It’s a good idea to limit access to important data and information by restricting access privileges to only a small number of individuals. Also, you can decide to use network segmentation to cut unnecessary communication from your own network to others. Internal breaches might also occur when employees work with unguarded or unprotected machines. They might unknowingly download malware, which normally wouldn’t be a problem if machines were properly managed. Updating your operating systems, antivirus software, business software, and firewalls as often as possible will go a long way toward solidifying your defense systems. It’s not all on your employees, however. Network administrators should employ monitoring software to prevent breaches by analyzing what is “normal” behavior and comparing that to what appears to be suspicious behavior. Cyber criminals often hide in networks to exploit them over a long period of time. Even if you miss them the first time, you should monitor suspicious activity so you can recognize impropriety and amend security policies before it goes any further. No matter how often we say it, there’s always room for improvement when it comes to your passwords and login procedures. In addition to text-based credentials, you should require other methods whenever possible. Great for fortifying your network, fingerprints and smart cards, for example, are much harder for cyber criminals to fake. Regardless of which factors are used, they must be frequently updated to prevent breaches, accidental or otherwise. In the end, no system is perfect. Zero-day attacks exploit unknown gaps in security, and human error, accidental or otherwise, can never be totally prevented. And for this reason, small businesses need to start embracing cyber insurance policies. These policies help cover the damages that might occur even under a top-of-the-line security infrastructure. Considerations for selecting a policy include legal fees, first and third-party coverage, and coverage for reputation rehabilitation.